Congratulations to all the WCCA winners. NOW Biff uses a chainsaw! He should have used it to threaten the objects in his living room to not attract dust! Keep it up, Chris, and some stupid teen somewhere in the states will blame you when they do something stupid. I can’t promise it won’t be me… But think of all the attention to the site! Huh, at first I thought he’d managed to go through the table without touching the meatloaf. I missed that tiny little slice on the other end. For the NEXT pic, I envision the meatloaf buried DEEPLY into the wall (flung there by the chainsaw), because there’s NOTHING that anchors it to the table! To Biffs credit, I would have expected him to pick up the chainsaw by the business end. So the loss of only a table is pretty good going. Pretty odd way that he sliced it. The cut part of the table is so far away from the meatloaf! It’s like…a divine fumble! Good job, Biff! You continue to entertain us with your bizarre antics! i was just lookin at the comic where biff is try to catch rats with a mouse-trap game, i was never patient with that game,so i put it together, and launched the trap. (for this comic) Biff would be perfect for an add for a chainsaw company it, would say ” Our chainsaws are so sharp it can cut through meat loaf”,do you think he would be perfect for an add. Actually, if you think of all the ways the table could fall and the meatloaf lands/slides after the table falls that should be about right, with the way the table is sitting. That’s a sturdy piece of meatloaf. 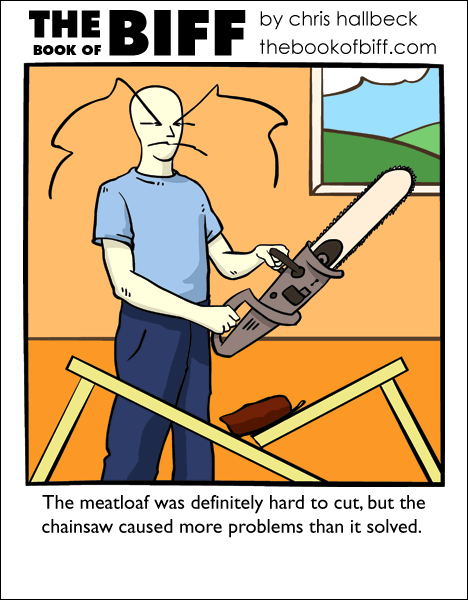 This would make an awesome animation…seeing Biff cut meatloaf with a chainsaw…and not just a comic of the result. What’s meatloaf? I’ve heard of it before, but have no idea what it is, other than edible. Is it bread made of meat or something? Meatloaf is basically a slab of ground meat, often with cheese and onions in it. Isn’t that always the case with Biff? Doesn’t it always? With the exception of zombies of course. Hahah, Remindes me of Rocky Horror Picture…. My spaghetti turned to rubber. that caused a problem. though, now the car’s tires look pretty interesting. When I was in grade school, we read this poem called “My Mother’s Meatloaf” I think. It was from a kid talking about the indestructibility of his mother’s meatloaf. I can’t remember who it’s by, and it’s frustrating not being able to find it. He should have tried a torch the first time around – to soften it….but don’t caramalize it.